Our rubber duck race continues with a question. How much do you know about the CelebriDucks flock? Do you know which duck Craig is talking about in the quote below? “The duck consumed me like Richard Dreyfuss was consumed by mashed potato mountains. ” Craig Wolfe, founder and creator of CELEBRIDUCKS. Answer the question on our facebook page or email us. Keep your duck moving along by liking, commenting or most importantly sharing. Ask others to share to make your rubber ducky go faster! 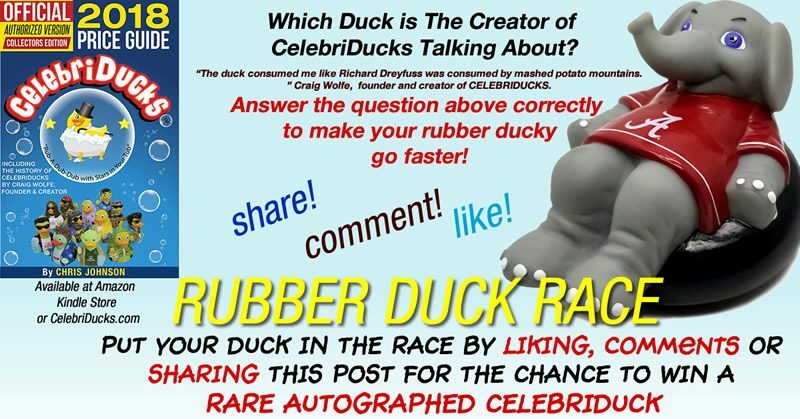 Get your virtual duck in the race to win a RARE SIGNED CelebriDuck by creator, Craig Wolfe! We are giving away, for the FIRST time ever, a one-of-a-kind autographed CelebriDuck character. What better way than to have a duck race. We are celebrating the newly released 1st. EDITION CelebriDucks History and Value Guide, Kindle Edition. WIN THIS 1st. 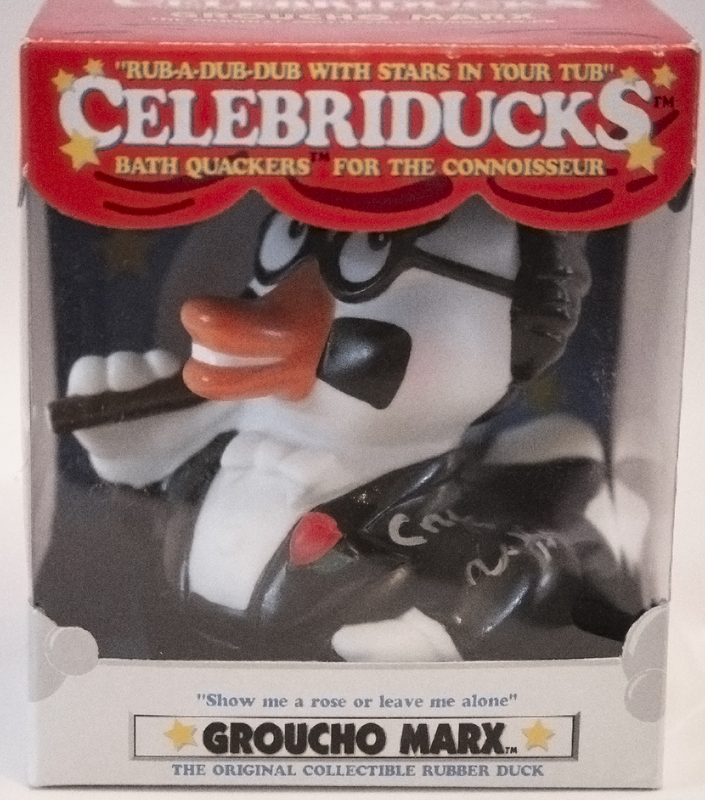 EDITION – GROUCHO MARX SIGNED CELEBRIDUCK! From the stock room of CelebriDucks, a signed first edition, Groucho Marx autographed by Craig Wolfe, creator of the popular CelebriDucks Characters. (This is an original first edition one of the first characters ever made), It is the larger version, and in its original box. It is a true collectible and rare find. This is one of the first ducks as described in the book, CelebriDuck history and identification guide. The kindle edition is the most comprehensive collection and identification guide to the CelebriDuck characters ever. Packed with ducky details including history of the company, how CelebriDucks are made and more. “The duck consumed me like Richard Dreyfuss ” was consumed by mashed potato mountains.” Craig Wolfe, founder and creator of CELEBRIDUCKS. 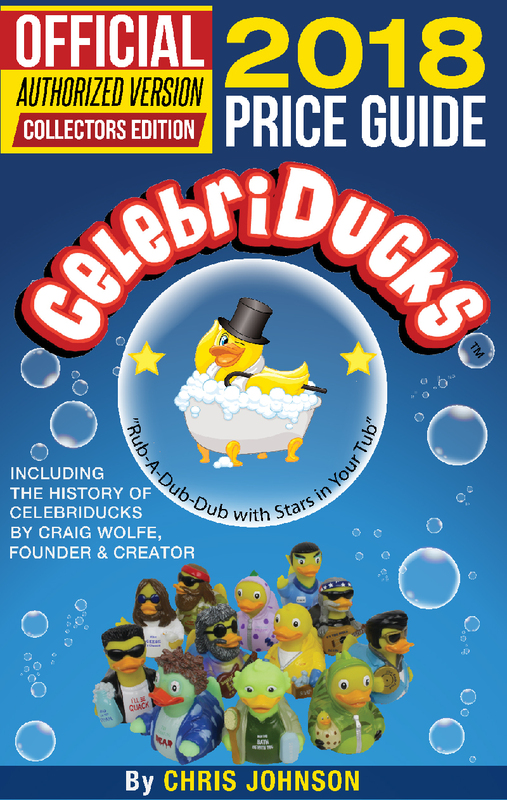 The book is the OFFICIAL and AUTHORIZED version as told by Mr. Wolfe, founder and creator of CelebriDucks. Prizes for the winners of the race are autographed CelebriDucks, personally selected from Craig Wolfe’s private duck pond. Never before has there been an autographed CelebriDuck released. Now’s your chance to get the very first one. To enter the Facebook duck race, just make sure your share, comment or like appears on our post or contact us via email to enter. We are not responsible for any issues, but you are welcome to contact us to make sure your duck gets in the race. ~ Share the Facebook post. We are holding the race on the river of Facebook, which ducks land where. CelebriDucks are loved all over the world by babies to collectors. From the safest duck in the world to the hatching of the Costume Quackers line. Winner will be randomly selected based on the recorded LIKES, SHARES or COMMENTS. ~ For those that get the book, leave us a review on Amazon, or send us your receipt/proof of purchase and we will randomly select a winner from the submitted emails. ~For those purchase a duck from the CelebriDuck Store can also get in on contest simply email info@celebriducks.com to enter. Contest runs during the duration of our Kindle/Amazon introduction. Random winners will be notified via email and announced on our CelebriDuck Facebook page. Contact us if you have any questions. Looking to know how much your CelebriDuck is worth, when and how many were made? Click here to purchase a downloadable .PDF version from the Author’s web site where you can download to your computer for only $4.99. We are proud to present our 2018 Official Authorized-1st. edition of the most comprehensive collection of the CelebriDucks Characters Line. Includes the history of the company. In this authorized 2018 first edition, we present the history and comprehensive price guide to the CelebriDucks that have hatched over the years. Many ducks and characters are retired, but there are countless editions still available for those looking to add to their rubber duck, famous personalities, and toy collections.